All That Yarn - Knitting with leftover yarn. Here's what it looks like on my hand. What to do with odd leftover yarns. Here’s one for the knitters with leftover yarn. This is a simple pattern and doesn’t take long to make up. I did several one year for Christmas gifts for my co-workers. I had yarn that I got on eBay as odd amounts of a discontinued yarn or estate sales, or grab bags from yarn sellers online, or found at one of the discount yarn surplus places online. I have used Smiley’s Yarn out of New York for a lot of yarns that are discontinued and are types of yarn/brands that I like to use or find interesting textures and colors. I think that their minimum order is either $50 or $60 so I end up buying more than I think I can use up. There’s a project out there that I will find to match with what I have on hand. That’s what happened in this case. Shows opening/sewn parts above and below the thumb hole. Some Ombre yarn self-stripes. Pretty yarn, but what to do with it? I bought several colors of skeins of Lily’s Twinkle yarn which is a tiny chenille and metallic thread (wrapped around the chenille thread). 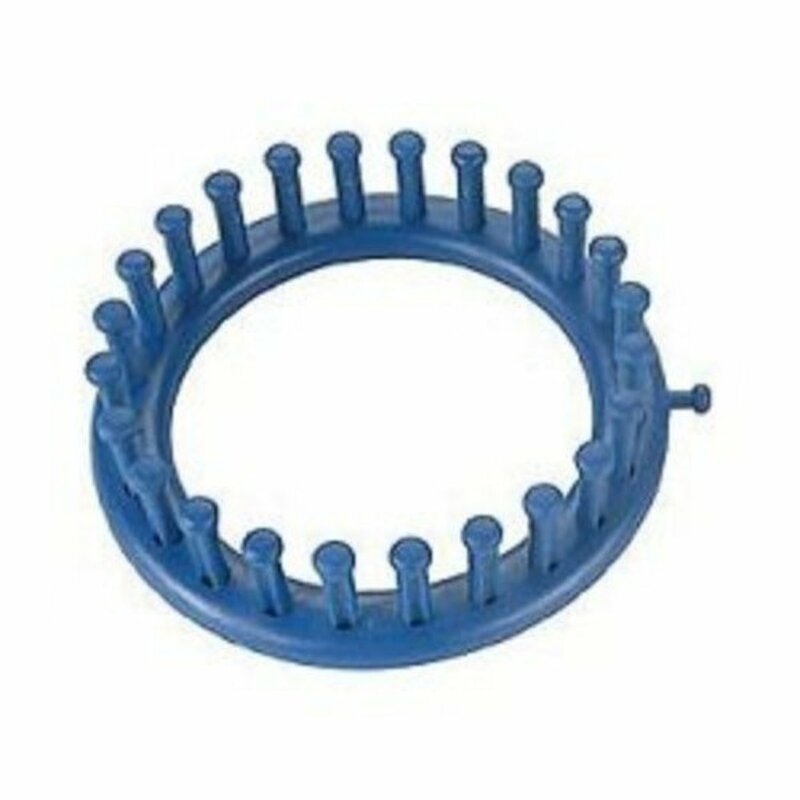 It is not machine washable, just hand washable. I didn’t know until I got it what it was like and how it would wear. I thought I could make some scarves out of it, but then there are only so many scarves I can use for myself, and it is a metallic thread which is sometimes scratchy to tender neck skin. 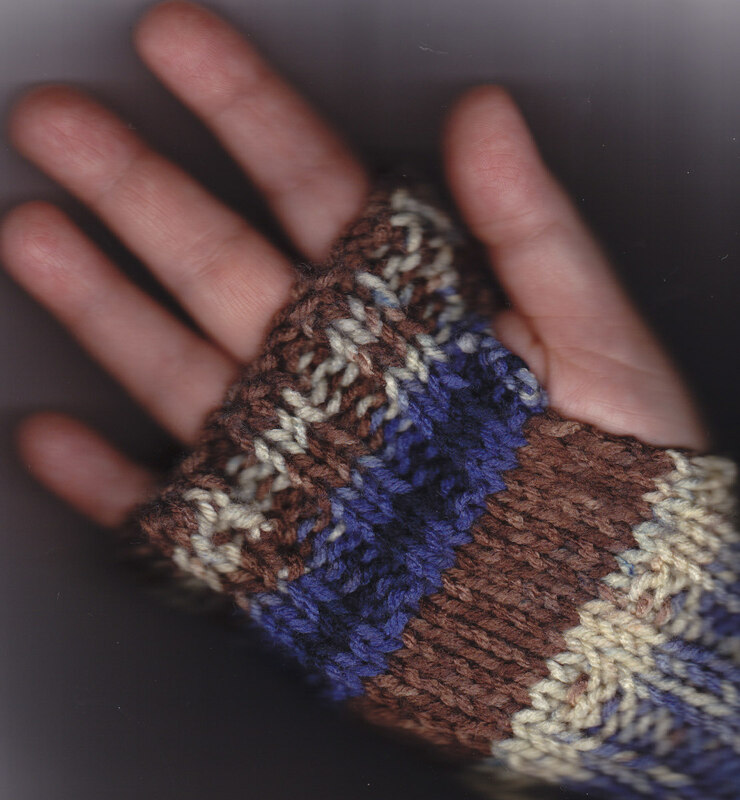 I decided to make Fingerless Mitts out of it. I was also asked to make some for other people when they saw mine and wanted to get a pair for themselves. 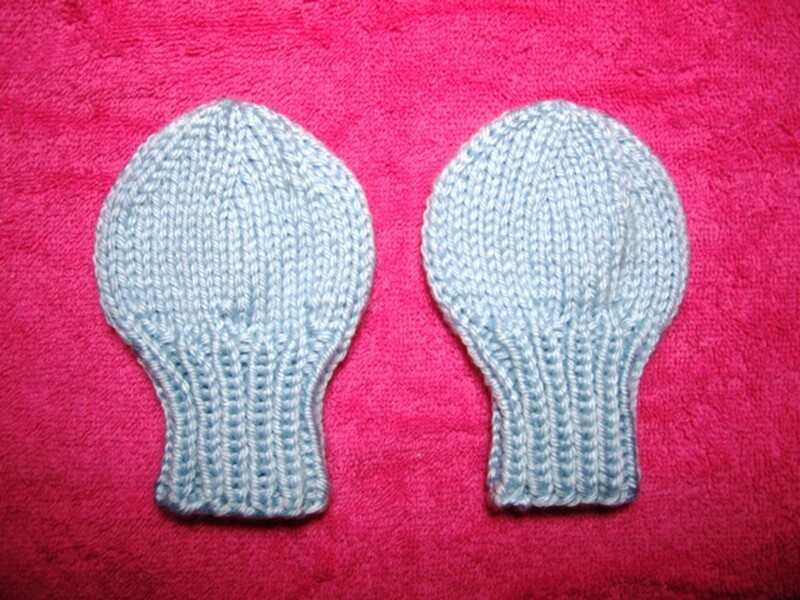 Since I made these for myself, and the people asking didn’t know how to knit (or crochet), I said “sure” and went home and whipped out a pair in an evening. Pretty yarn...but what to make? 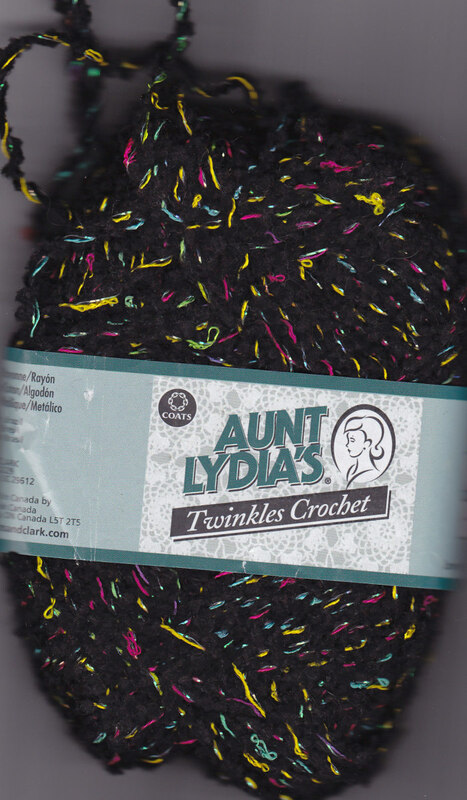 Yarn Label - shows yardage, ounces, color, washing instructions. 2-3 ounces of yarn, either Sport or Worsted Weight will work. Cast on 32 stitches. Leave a 6 to 8 inch tail for sewing later. Start with the Knit and go in a knit-2/purl-2 ribbing stitch for two inches (2”). Switch to Stockinette Stitch (knit one row, then purl one row) and repeat for two inches (2”). Then back to Ribbing (knit-2/purl-2 across the row) for two inches (2”). You should end up with a total of six inches (6”) from cast on to bind off row. Bind off in the knit 2/purl 2 ribbing stitch. Leave a 5-7” tail for sewing. Now, using the tail from the cast on, sew from the cast on edge for two and a half inches (2.5” or 2 1/2”). Skip the middle part to leave an opening for the thumb hole. Sew from the bind off edge for one and a half inches (1.5” or 1 1/2“). How I came up with pattern. 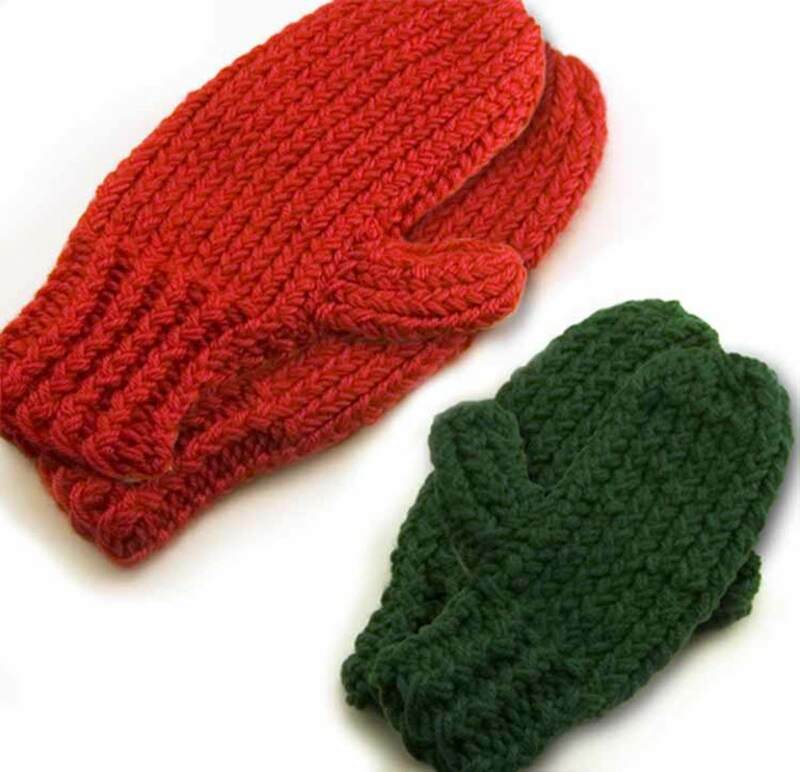 They are great for keeping your hands warm and leaving your fingers free to type or text. I think I adapted a pattern that I saw, as once again it was hand written with no clue on where I got it from or if I made it up myself after seeing other patterns. All I know is it is scribbled down on a small piece of paper and stuck in with the Lily Twinkle yarn balls. I like to put information with my yarn so I remember which project I wanted to do with the yarn in the bag. 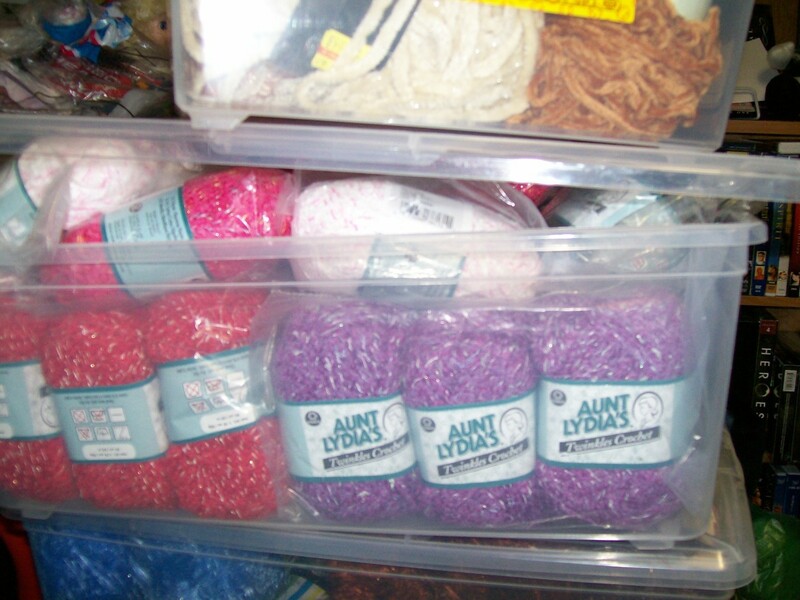 My stash is in boxes by color, except for the odd ones (skeins of specialty yarn) that need a box by themselves. Then I put the pattern or patterns in sheet protectors and toss them in with that yarn so I know what I was planning on doing with it when I find time to work on it in the future. That’s how I did it with my Rose Garden crocheted afghan (see my first blog entitled All That Yarn). I had all the colors of the yarn picked out for the pattern and then put the pattern (copy) in with the yarn in that box. It makes it easier to know when I find it again. I forget what I have until I go through things and say “OH! That’s where it went!" and re-discover the ideas I had planned when I put the yarns and patterns together in the boxes. Fancy Fur (by Lion Brand) for a hat and a scarf in red. How about a fancy scarf? Another good use for odd skeins of yarn is making unique scarves. 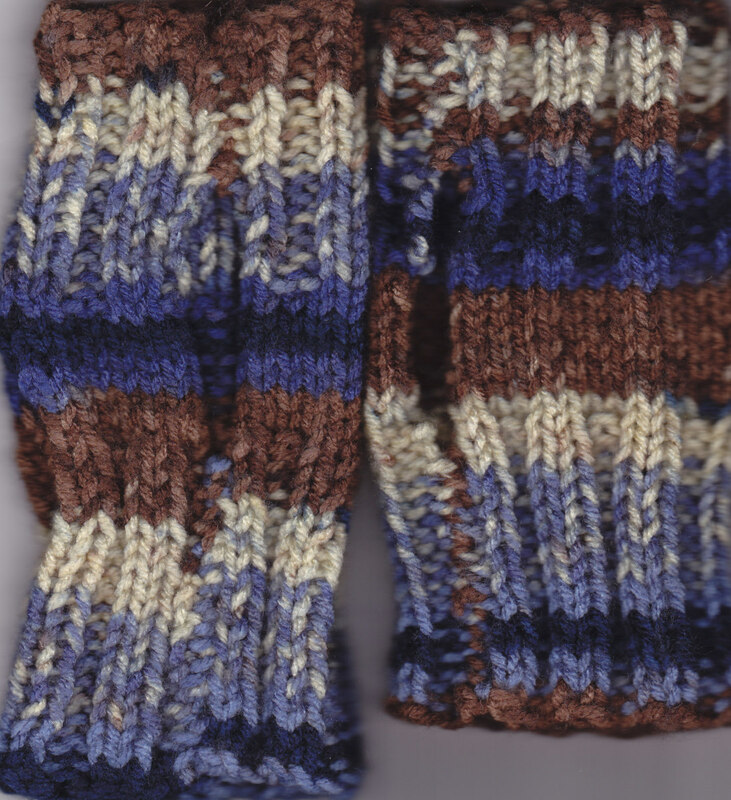 A quick pattern is cast on 10 and knit every row until only a yard of yarn is left. Then bind off and weave in the loose ends. Needle size will be determined by the yarn. 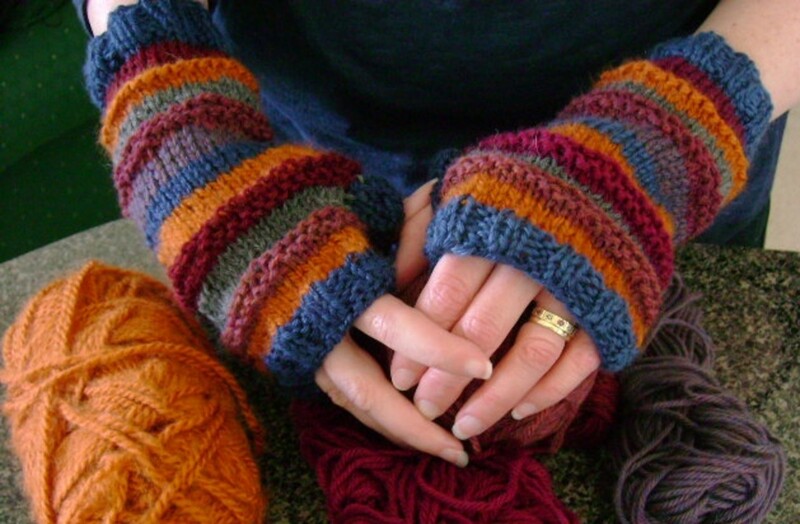 Fatter yarns need bigger needles like 17, 19 or 35, while skinny ones can use 11, 13, 15, or 17. The less yardage of the specialty yarn, the shorter the scarf will be so check the label (if there is one) for how many yards are in a ball or skein. I find that matching a fuzzy, furry, chenille, eyelash, or other specialty yarn with a color-coordinated acrylic worsted weight yarn works very well. The worsted weight makes a nice “carry” thread to show off the specialty yarn. 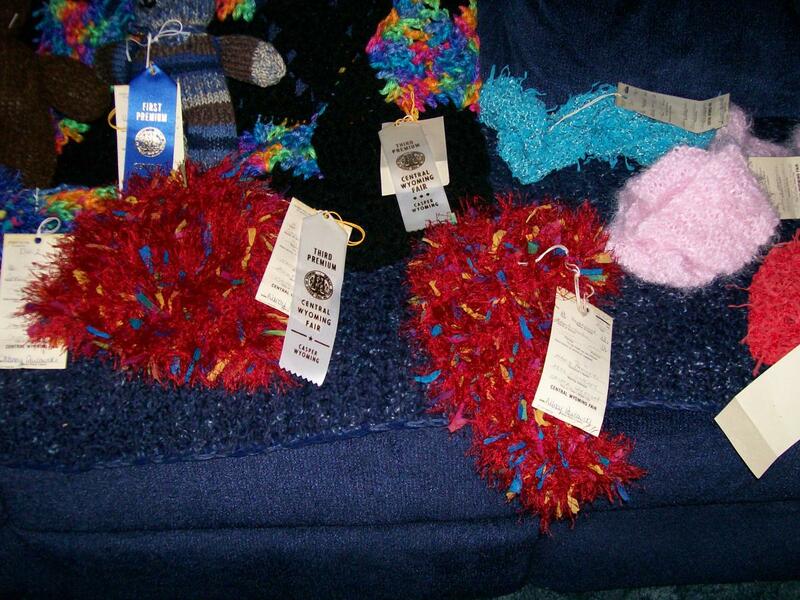 I had odd balls of yarn from my eBay purchases of estate sale yarn “grab bag” boxes of yarn. I paired the specialty one with an acrylic yarn, sometimes from my stash if there were none in the sale box, and set off knitting a scarf. Sometimes there is a thick-and-thin yarn that will work all by itself. Again, yardage is important in making sure you have enough to finish the scarf. Using two or more colors of a fur, etc. for doing stripes with what yardage is available works too. I have paired a colored eyelash with white or similar color (for example, a dark brown eyelash yarn with a light brown acrylic), and used a white specialty yarn with a colored acrylic as the “carry” thread. Washing the scarf is based on whatever the most delicate setting is listed on the label, like “hand wash only” would be for most specialty yarns. Hand wash in cool water with mild soap like Ivory soap and then roll in a towel to get out the excess moisture. Don’t hang it up to dry! as the shape will be distorted by hanging. Other ways to find pattern ideas. Another way to find quick scarf patterns, especially with specialty yarns, is to check out the website for that particular brand. If it is a newer yarn then there should be a website listed on the label. Some of the older yarns are still listed in patterns on the websites or other places that have pattern books. For example: Lion Brand Yarn’s website has the “old” patterns for yarns that are discontinued or no longer sold by the company but might show up elsewhere for sale. 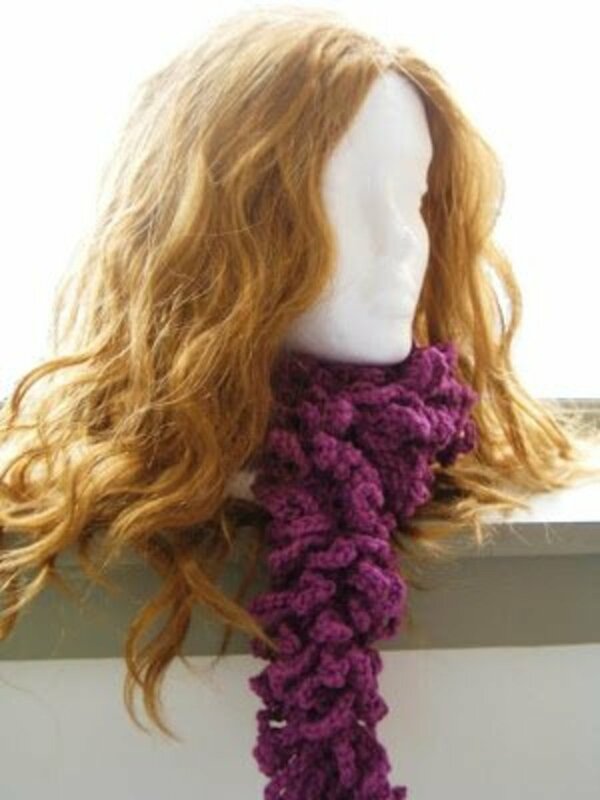 Just search with the name of that yarn in the patterns for scarves. The same can be said about Red Heart or Coats & Clark websites that have older patterns for discontinued yarns. It will take some digging to find a pattern for a yarn that you have NO label on it and no clue as to what kind of fiber you are dealing with. When in doubt about the fiber, the best bet is to always hand wash it, since even wool can be hand washed with few problems. 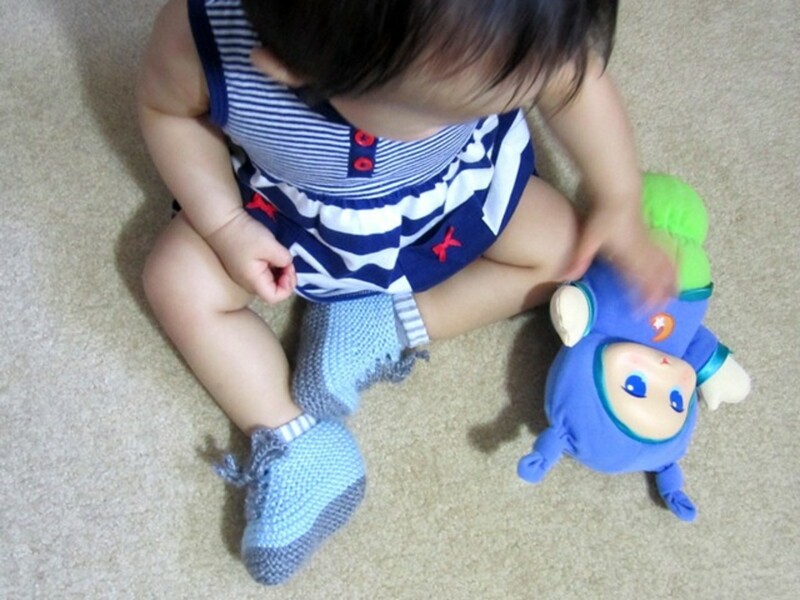 Cute Knitted Shoes for Little Feet. Free Pattern with Videos!